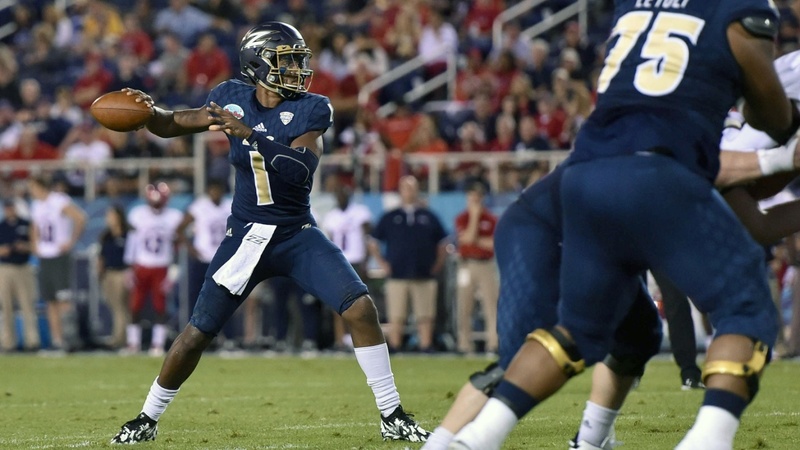 Can QB Kato Nelson Give Akron's Offense a Little Extra Zip? We're republishing our opponent preview series from the summer with each new week. Up first, a look at Akron. The Huskers kick off 2018 Saturday at 7 p.m. against the Zips. Last year’s FPI ranking for Akron sat at No. 104 in the preseason. This year, ESPN’s predictive Football Power Index has the Zips at No. 104 again, predicted to go 5-7. That was the same record Pythagorean Expectation pegged for last year and that Zips squad won 7 games. Those two wins to the positive side? A one-point win over Western Michigan on the road and another one-pointer over Buffalo at home. Now, armed with that knowledge, tell me what’s in store for a team that is pretty much the same two-whole-points-better-than-a-five-win-team from a year ago, minus a senior quarterback? Seriously, your guess is as good as mine. The Zips come to Lincoln for the Huskers’ season-opener on Sep. 1 for an under-the-lights affair and it will likely feature two offenses trying to find their footing. The Akron defense will mostly be a known commodity. Nine starters return to a unit that was okay (not great) at the bend-don’t-break defense. They weren’t able to prevent those medium-gainers that keep things on track — either in the air or on the ground, though slightly better through the air — but they hung their hat on preventing explosive plays (second in the MAC last year in yards per point, 15.82, and 31st nationally in IsoPPP, 1.09) and forcing turnovers. All four members of the secondary return after getting hands on 19 interceptions last season. Still, Akron gave up just a shade over 30 points a game. We’re talking about a seven-loss team here. It needs help from the offense and it didn’t get consistent enough help last year. That will be the big question again this year. Running the ball was a major challenge; Akron sat at 4.08 rushing yards per play for 2017 (ranked 121st in the country) and broke a run that gained 20 yards or more just 11 times in 13 games. In six of seven losses last season they were held under 100 yards rushing and below 3 yards a carry. Not much success there to be found. The keys being handed now to sophomore dual-threat quarterback Kato Nelson can go one of two ways. One: the very presence of a quarterback that can make a play out of nothing with his feet helps alleviate some of the bottling up that occurred last year. Thomas Woodson was the starter for the first nine games and he was less a runner than Nebraska’s Tanner Lee. Over that stretch, Akron topped 100 yards on the ground three times. Once Nelson entered the starting 11, it wasn’t like he was running all over defenses but the desired impact was felt; three of the final five games saw the Zips top 100 yards rushing as the quarterback took on some scrambles and designed runs. And Nelson popped off for 322 yards passing in a Week 11 win over Ohio. With last year’s top receiver back in Kwadarrius Smith, maybe Nelson can make things work were Woodson couldn’t. Or there’s option two: inconsistencies continue to rear an ugly head and Nelson isn’t the quick-fix solution to a struggling offense. Over the entire season, the team was three percentage points below the national average in explosive-play percentage (ninth in the MAC, 12.58 percent) and once Nelson took over it had as many sub-100-yard passing days as it did 200-plus-yard days. Those two things don’t mix. They can’t mix if an offense is going to function. And though the Zips will be facing a pretty light 2018 schedule, option two feels like the more likely scenario this season as Akron tries to replace two of its top three rushers while developing a young quarterback. Nelson flashed promise, but he's still pretty green. He's thrown 20 passes or more in a game just three times so far. (A combined 48.9 percent completion rate in those three games doesn't make you feel any better either.) And mistakes are part of the learning curve when it comes to young quarterbacks. Is that defense good enough to hold up against turnovers? Is there enough trust in Nelson to let him sling it if the opponent gets up big? We'll found out. So I guess the irony here is at least the expectations are pretty consistent.